Expected goals: What are we learning from new metric? Reality Check: Are England terrible at penalty shoot-outs? In the program, class was defined as a team's Elo rating before the match. This rating is cumulative and has been built up over decades of international play. A nation's form was the points change in a team's Elo rating over the previous two years - this is a common interval between international football tournaments. Because of the infrequency of international matches, a large timeframe was needed to build up a picture of form.The program also contains data from thousands of international tournament and qualifying matches since 1960, including the number of goals scored by each team, as well as their class and form (as defined by Elo ratings). 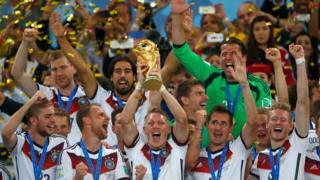 It used this data to replay hundreds of real-life World Cup finals matches between 1962 and 2014. These predictions were then compared to the actual results. When the program based its predictions on class, it correctly predicted 76% of wins and losses.In comparison, the accuracy dropped to 52% when its predictions were based on form.Although the program didn't get it right 100% of the time for either type of prediction, these results still suggest that a team's class is a much better predictor of its World Cup performance than form. Despite topping a tough group in the opening round, the program predicted that Costa Rica's fairytale journey would have been ended by Argentina in the semi-finals.